Apple’s Comparison of the iPad Mini to the Nexus 7, What a Joke. If you joined us during our live chat of the Apple iPad mini event, then you probably saw the point of the presentation where Phil Schiller compared the new smaller iPad to Google’s Nexus 7. He went through slide after slide, clever quote after clever quote, to trash the Nexus 7 in as many ways as possible, all while touting the new iPad as a far superior product. The thing is, at $329 and with a bigger display, the comparison doesn’t make any sense. We have seen Apple play their childish comparison game with fake stats and their own made-up buzzwords numerous times in the past, but this has got to be the worst one yet. 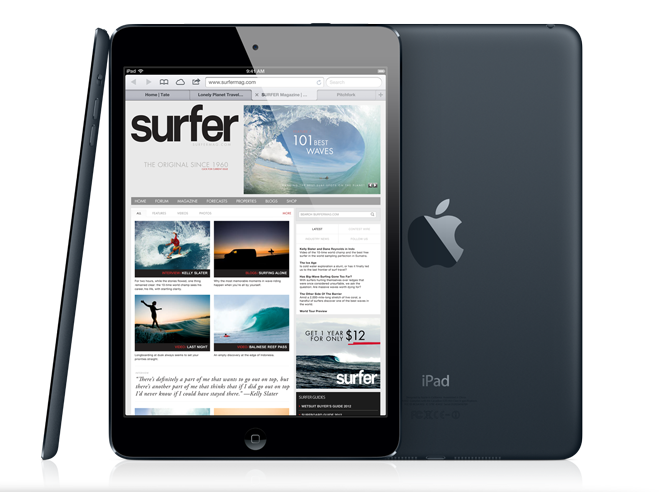 The new iPad mini has a 7.9″ display and the Nexus 7 has a 7″ display. Schiller and the Apple PR team decided that the best way to say that the new iPad mini is better, is because it has a bigger display. As if the average, everyday human being, couldn’t figure out that 7.9 is a bigger number than 7. Yep, we’re getting scientific up in here. But beyond just pointing out size, in came the stats of more square inches of display, a higher percentage of viewing space and web browsing enjoyment, and on and on. Again, yeah, that makes perfect sense. IT’S A BIGGER DISPLAY. Of course all of those numbers are going to be bigger. What Phil skipped quickly over, was the fact that the display on the iPad mini is only at a 2002-ish 1024×768 resolution, while the Nexus 7 has a 1280×800 HD resolution. In other words, the Nexus 7’s is better for viewing almost anything, especially videos. No retina here on the iPad mini. Actually, it’s about as far from being retina as you can get and is almost laughable in today’s tech industry. He also went through a number of slides that included cherry-picked apps that have been optimized for iOS tablets, yet haven’t been for Android tablets. Look, we get the tablet app argument, but the cherry-picking is beyond over the top. Where was the YouTube slide? Better yet, how does Google Maps look on iOS? Or Gmail? Oh, wait. We can do this all day long. The most ridiculous portion of the entire thing, that helped turn it in the most ridiculous comparison ever, came at the very end of the iPad mini segment when Schiller talked price points. At first, we were on the edge of our seats, wondering how on Earth they managed to make such a product and keep the price at the same price as the Nexus 7, which is sold with 16GB of storage for $249. Except the iPad mini isn’t priced at $249. Nope, it starts at $329 for WiFi and 16GB of internal storage. So essentially, the comparison was of two products in completely different categories, yet Apple made it sound like they were brothers. Apple seriously just compared a product that costs almost a $100 more, essentially targeting it at another target audience and into a separate price point. Indeed they did. That’s how Apple works, folks. Apples to oranges, reinvented. Oh, we should also point out that a 32GB Nexus 7 is on the way and will be priced at $249. Update: We tossed together a spec comparison chart here. Meh. Can’t wait until next Monday.